Another artist suggested etsy. We bumped into each other delivering our newest creations to an old world pottery gallery in Cedarburg, WI. In seconds, we both admitted that we were chained full-time to unrewarding desk jobs, leaving precious little time to “do what we do”, naturally followed by commiserating about having to steal time(and gas money) just to drop off our work after finally, finally, finally finding a reputable IRL shop to consign with. She had heard of an online phenomenon called etsy, and had read up on how easy and relatively inexpensive it was to ‘set up shop’, but was hesitant. So she asked me to take a look and tell her what I thought. 2 weeks later, I had selected 2 of my pieces and turned one into my banner and one into my avatar, without having had the faintest clue what either one was, much less how to create them. Etsy made ‘setting up shop’ easy. It’s hard to think of a corner of my yard, even the somewhat scraggly, used to be vegetable garden, that doesn’t inspire me with graceful growing things. This far north, the growing season is competes with winter, and neither one wins. But that makes the anticipation of spring crocus, scilla, snowdrops, and wildflowers all the sweeter. Moments later (or so it seems), tulips, hyacinth, and bleeding heart are up, followed by wave after wave of delicate, nodding shapes and heavenly perfumes, right up to and including the always ridiculously brief explosion of autumn color. Then months and months of unbearably bare landscape. If I had to pick a favorite, though, any branch of my ginkgo would win for grace and elegance, hands down! Uniquely textured, supple leaves arranged in delightful clusters highlight the tree known for its longevity. I’m a Wisconsin girl, born and raised in Appleton, in the Fox River Valley, and transplanted as a young adult 100 miles south in Milwaukee. Even though we live in the city proper, I’ve always appreciated living across the street from one of the city’s many, many parks. With bunches of green space, old fashioned playground equipment, a wading pool, 2 baseball diamonds, and a hill the kids used for sledding, the park increased our living space for the past 25 years. Nowadays, it gives 4 grandsons room to run and provides as many leaves as I could ever hope to press into clay, in case I ever run out of flowers and leaves in my own backyard. I began with a sheet of what used to be called typing paper and some discarded generic watercolors. My mother still has that first effort, framed, hanging near oil portraits of my 7 brothers and sisters and me. Living where I still live and raising 5 kids to be happy, confident, and kind, involved all the art projects, birthday cake baking, painting, sewing, knitting, etc, that you can imagine! All wonderful, every single moment! I was lucky enough to rediscover watercolor, then discover pottery, and to practice them both for many years. Then almost 5 years ago on Thanksgiving Day, just about at noon and in the bright, cold sunshine, my oldest son was robbed, shot, and killed. About a mile from home. Months later, when I couldn’t scream and cry in agony in my family’s presence any longer, it returned to the pottery studio. Clay isn’t bothered by my tears. It allows me to think, and to remember, and to make something as beautiful as I possibly can out of it all. And somehow the clay absorbs every tear. Let me preface this by saying that my computer experience prior to etsy was what you could call average. In my first year of college at the University of Wisconsin in Madison, I dutifully purchased a stack of narrow, manila colored punchcards, took them to the lower level of the mathematics building, stood in line for what seemed like hours, and handed the cards through what looked like a glass teller’s window to one of a row of shivering, uncomfortable women layered with sweaters and fingerless gloves. Unsettled by the icy hand that snatched my bundle of cards and believing I’d have little chance to be ‘in the driver’s seat,’ I backed out of line, out of the building, and tested out of math so I’d never have to return. Since then, I’ve ‘interfaced’ with computers only about as much as my current job required. So if I can do this, anyone who wants to do it, can! If you’re passionate about what you make or do and really want to ‘get it out there’, think about etsy like learning to swim. The more lessons you have under your belt before you wade into the river, the less likely you are to feel like you’re being swept away with the current. Don’t get me wrong, etsy has made all the basics pretty well foolproof, so you won’t drown. Even if you slap your descriptions and photos together quickly, the etsy applications and instructions are so 1-2-3 that you’ll have a shop in no time at all. But taking advantage of etsy’s staff and their advice on how to light, arrange, or crop your images or how to write your description (and what not to forget) from your buyer’s point of view can save you the incredible amount of time it has taken me to re-photograph and edit every , single listing. Not that I’m done; not by a long shot! I’m not at all satisfied and am continually making adjustments, especially with my photos. But etsy’s framework keeps me afloat in the meantime. I’m proof that, using what you have to work with, you can start (even if it’s a slow start, like mine)! Instead of letting my thoughts race around and around when I wake up before sunrise, I head straight for my backyard if the weather’s nice, or dash out to the garden for some fresh cuttings and head inside to my basement ( ummmm, errrr, I mean “studio”) to start pounding clay. Starting the day by starting a new piece, trimming, glazing, or unloading my kiln always tends to make the rest of the day more satisfying. More of the same. I’m sure it and maybe other things’ll become more fun again, someday. Right now, though, I’d say ‘doing what I do’ sustains me. It keeps me upright. Like a sustained fall, … my ceramic and watercolor work is what helps me to continue putting one foot forward after another. Without it, grief would surely eat me alive. I’ve avoided looking into etsy teams because I’m certain I would like to be join one! Sound confused? Since my work is not nearly so clamored after that I can entertain the notion of quitting my day-job (notice the small number of sales I’ve had), I have to take time away from making artwork to do anything else, including be part of a team. I’d hate to benefit from being part of a team without having enough time to contribute to my team, so I’ve been putting that off. Do you have other sites or blogs? Posts links if you like. http://www.facebook.com/people/Faith-Givings/581981491#!/pages/Faith-Ann-Originals/247418049654 is my Facebook site for a good look at my work, old and new, with links right back to http://www.etsy.com/shop/FaithAnnOriginals on etsy! It’s a good way to post upcoming events at the number of local botanical gardens, pottery and gift shops, and galleries that show my work (and their links) without cluttering my etsy page. Pick 3 of your favorite items to be showcased. Choosing my three favorite pieces for your readers is difficult, especially since my favorite is usually the piece I just finished. But with the holidays just around the corner, I just designed a number of ornaments celebrating favorite activities, locales, familiar scenery, flowers and wildlife. A total of 99 of them, to be exact, and far TOO MANY from which to choose a favorite. So, aside from the ‘hot out of the kiln’ ornaments, I’d like to show you examples of both of my construction methods. The first is an example of a sketch, which I hand carve, then press into clay using my grandmother’s rolling pin. The second involves pressing real flowers or leaves into the clay before creating a form, again, using my grandmother’s rolling pin! For more on how I do what I do, see my etsy profile! 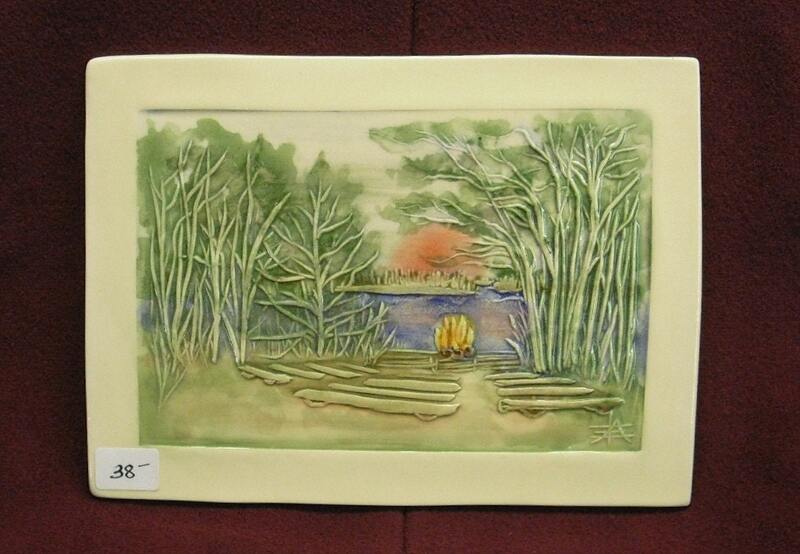 “Chalk Hills Camp: The Amphitheater” is a handmade, watercolor-glazed, ceramic tile. Chalk Hills was a Girl Scout Camp along the Menomonee River in north-eastern Wisconsin that no longer exists, except in the memories of many, many campers and counselors; my four sisters and myself, included. But, with just a little encouragement, each one can still smell the campfire, hear camp songs being sung in the distance, and look down to find their feet on the path to the amphitheater. 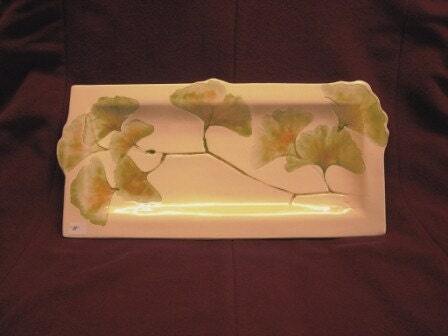 Favorite Ginkgo #2 is a handmade ceramic piece of art to hang & display, but this piece of art can also be pressed into service as a serving tray! Can you imagine the looks you’d get, plucking this decoration off your wall and returning with it to serve some spicy hummus and pita or your favorite Christmas cookies? I combine fine, white clay and real ginkgo leaves and branch with care to create this one of a kind piece of handmade art. The detailed impressions left by these graceful, intricate leaves are slowly dried, warmly glazed with my signature watercolor effect, and kiln-fired twice. The result of this 2 month long process is a handsome and unique piece. Like the majority of my work, this handmade art is a delightful, one of a kind conversation piece. I hope you enjoyed seeing it! This is a sweet little piece of jewelry for that small space on your wall! If the “walls” that surround you (or anyone you care about) are of the drab, cubical persuasion, they NEED SOME JEWELRY all the more! Small, heart-warming, lovingly made CUBE JEWELRY! Each piece of CUBE/WALL JEWELRY I make is made with a real ginkgo leaf. This one measures 4” x 4” and comes ready to warm your home or the heart of someone special! In case you’re not into cube jewelry, take a look at my ginkgo leaf brooches. I usually use the smaller, more delicate ginkgo leaves to create thoroughly wearable, one-of-a-kind brooches. Small or large, they’re the perfect lapel pin, or ideal to secure a scarf or otherwinter wrap! Would you recommend a shop that you would like to see featured here. I had someone in mind who I’ve never communicated with, but whose work I always admired. Even tho I don’t recall the artist’s or shop’s name, I could always find her by searching handmade for Wisconsin pottery white (for white clay that she seemed to use exclusively), but today she seems to have vanished from etsy! Sorry…rushing off to that 8-5 gig. I love everything that u do. I want everything that you have. i am blessed to have faith as a friend and inspiration.. to watch in awe as she studies a dragonfly land on her.. then draw it, carve it into clay and voila create an amazing piece of art. everyday as we trudge through our ‘work’ i am fortunate enough to steal some moments of pure joy watching her in her true element. I thought the same thing when I first saw her work. I hope to see her work in person some time. I was really blown away the first time I found her Etsy shop. Wow, how fortunate am I? I have many of Faith’s creations from over the years. But, I still need more. They are the BEST! I guess I know where to find her, after all, she is my sister 🙂 GO FAITH! 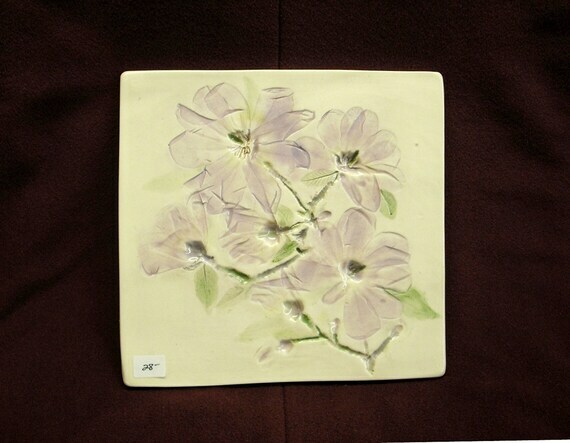 I am collecting all of her native Wisconsin flower tiles for my bathroom. When we build our new home, I will use these tiles as my bathroom tiles! I am going to do the same with Faith Ann’s herb tiles for my kitchen back splash:) I have many pressed flower pieces of hers throughout my house along with hand carved pieces pressed into special ideas I’ve suggested. For example, a lovely covered bridge in Wisconsin. Call me bias but Faith is my oldest sister and I am the spoiled baby sister. I do believe though that you definitely don’t have to be related to see the beauty and love in all of her work. We are very happy to have Faith’s artwork in our gallery. This is our first year that we have represented her and we are pleased with her sales. We are looking forward to have new pieces in 2011 for our visitors to take home. Faith is unusual to say the least,just like her artwork. 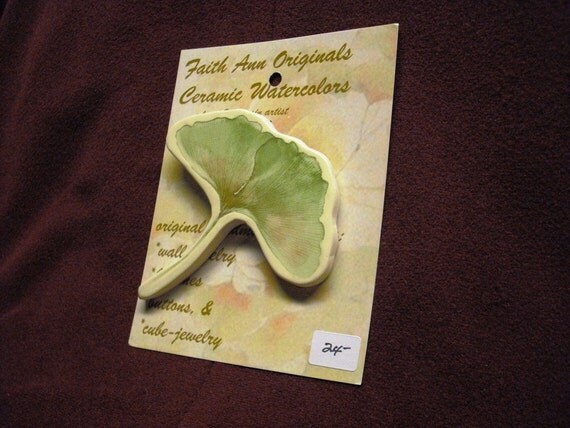 I am a huge fan and collector of Faith Ann Originals! What a fabulous find, I adore her work! So ironic too as I was just visiting WI this past weekend. Faith obviously has quite a following and there’s no wonder given the talent and beauty in her work ~ wonderful job Linda. Thanks for all the comments. Kathy please feel free to leave me a link to your gallery. Each and every one of you lift me up. I can’t thank you enough for the depth of your compassion, your many kindnesses, and never ending encouragement. Thank you for keeping me busy! Where oh where would I be without you? Beautiful, strong and seemingly fragile. Thank Calico for the Susie Scribbles link. I sure will. for me is a blessing for good health in life. Hi Faith, I love the article and the pictures of your artwork although they are so much more beautiful in person. Looking forward to seeing you soon in Cedarburg. I have opened my shop, because I wanted my old dream to come true. I used to draw a lot at school and intended to study arts. But I have chosen the studie of the English language and foreigh literature. But if you have it, it bothers all your life. At first Etsy was a very good place to relax after my job. With the encouragement of the Baltic etsians I decided to open my shop. Thanks Astra for your comments I am sure Faith appreciates it. I have gone to your shop and it looks nice. It is heartening from time to time to return here and learn from what some of you have chosen to refect on. Thanks again to Linda and to all of you, so very much, for sharing here, and also to those of you who have made contact through etsy. Connections like these help keep some of us strong, help keep some of us afloat! Faith you are still my favorite feature ever.